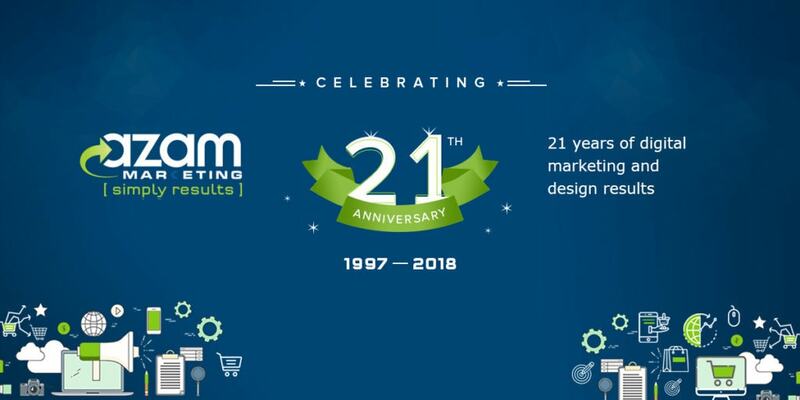 Azam Marketing’s Founder and CEO, Nadeem Azam, muses on a remarkable anniversary, one that is exceptionally rare for companies in the cut-throat and fast-moving internet space to survive long enough to mark. A week is a long time in online business and a hundred is an eternity in an arena in which my colleagues and I experience more changes in our day-to-day work in a year than people in professions such as accountancy, dentistry, legal work, teaching, plumbing, high street retailing, hospitality and many others will go through in their respective trades in a decade. For Azam Marketing to have been alive and kicking as of this week for not a hundred but an extraordinary 1,096 weeks is something that, on the one hand, flabbergasts me and, on the other, makes me feel blessed. In case you’re wondering why 1,096 weeks is worthy of penning this eulogy, it’s 11,047,680 minutes… or… to employ a unit of measuring time that will elucidate where we stand more clearly… 21 years. Mais oui, Medames et Messieurs, the 4th of August 2018 sees us mark our 21st anniversary! The internet was a different country back on the 4th August, 1997 when a naive, raw and enthusiastic incarnation of Nadeem, half my current age, seated himself in front of a Power Macintosh 5260 to formally launched his assault on cyberspace by going live with his first website on the free web hosting platform Angelfire. The web browser of choice towards the curtain call of that millennium was Netscape Navigator. Most people used dial-up internet connections with blazing speeds ranging from 28.8Kbps to 33.6Kbps and were salivating at the prospect of having 56Kbps. Google did not exist in 1997. Three years earlier “Jerryâ€™s Guide to the World Wide Web” had been renamed to something more catchy, “Yahoo!”, and a sizeable portion of the planet’s 121 million internet users would use the portal to find what they were looking for from the 1,117,255 websites in existence. From those embryonic days leap into a time machine, enter a date 21 years into the future to August 2018 and we crashland into a world in which there are 1,902,145,187 websites, and c. 4,456,932,140 people, more than 55% of the planet’s population of 7,730,758,428, make use of the internet. Yahoo has long since been kicked into the gutter by the leviathan Google that it gave birth to by allowing it to become the sole search engine provider on its platform, and has plummeted to a miserly 2.21% of the search engine market share; in June 2017 it sold to Verizon for a pittance of its former value. As for Azam Marketing during that 21 year time travel, while we obviously haven’t enjoyed anything like the growth trajectories of the Googles of this world, thankfully we have gone in the same direction of today’s all-dominant dotcom behemoths rather than that of Yahoo and the vast majority of our peers from the mid-to-late 1990s. The latter typically did not even last for five years beyond the dotcom crash, nevermind ten or twenty or 21. A significant ratio of potential customers rely on positive online reviews when they want to purchase a product or a service. Positive reviews online affect the buying behaviour of customers in every industry. Needless to say, a customer will gravitate towards a product with positive reviews instead of a negatively reviewed item. Depending on the search engine you are using, reviews will prominently appear in the top SERPs (search engine results pages) alongside listings from your site itself. Some surveys have suggested that online reviews make up to 10% of Google and other search engines’ results. Obviously a listing with positive reviews draws more attention as opposed to a listing that has poor or no ratings. There are many sources that Google uses to get local business information, and among them are the popular review sites. If you have a higher percentage of popular reviews coupled with on and off-page search engine optimisation, your business listing goes up in the organic results. If your business has positive reviews, it is a social proof that your business is legitimate. A customer can tell that what you are offering is genuine enough. Be mindful that negative reviews, while invariably upsetting, do not herald the end of your business. You only need to respond to them, and shows customers you care about their opinions. Positive reviews have everything to do with purchasing decisions by customers, whether they are buying online or visiting the physical location of the business. For instance, if the customer is looking for a restaurant, the reviews available play a role in the decision-making process. Every consumer needs to have trust in a business they are looking to give their hard-earned money over to! If you have genuine reviews, whether positive or negative, you get critical feedback from customers. You will use this feedback to help in improving your business. Most entrepreneurs are only too aware of the importance of a good reputation. What people think and say about your business is crucial. Positive reviews are a way for different businesses to acquire an advantageous position in the local SEO results. Search engine results that have good and positive reviews attract more click-throughs as well as physical visits. Having positive reviews in local search engine results can translate to winning a customer or not. Every entrepreneur wants his business to receive positive reviews. However, this is obviously not possible, particularly in an era in which most consumers have extremely high expectations. The clamour for positive recognition may drive some to employ black hat tactics. Note that you should never buy reviews as it is likely to eventually hurt the integrity of your business. These purchased reviews are fake and usually look fake. If you are discovered, your business will not only lose its reputations, but customers will walk out on you. It is possible for review sites to employ user tracking and other methodologies to identify fake reviews. It is essential to keep it genuine every time. Every business wants positive reviews because that is what will drive purchases and increase their profits. Having positive reviews also helps your business dominate the top positions within search engine results with favourable listings. A while back I went to a talk by the novelist Kazuo Ishiguro and he was bemoaning the fact that, even though he was raised in Surrey, England, and knew next to nothing about current affairs in Japan, because of his name, visage and ancestry, whenever anything newsworthy happened in Japan, journalists would harass him for his insights! A name such as “Nadeem Azam” is a liability in contemporary Britain, in which every day I am subjected to questions such as “where are you from?” and appraisals such as “you speak good English”, but when journalists want to reach out to somebody to be interviewed on, say, the Iranian nuclear deal or Abdel Fattah el-Sisi’s jiggery pokery, I get the feeling it helps! We’ve recently marked “World Population Day” and below is an interview with me in the daily newspaper “Gulf News”, in which I share my tuppence (“two cents” for my Stateside friends) on the population explosion in Dubai since the 1970s and the advantages and disadvantages of the emirate having an 83 percent foreign-born population. “Gulf News” is the most widely read website in English in the Middle East. It enjoys a combined print and online audience of 5.4 million uniques every month. “Nadeem Azam, CEO, Azam Marketing and Middle East Analyst and Marketing Expert, told Gulf News that large cities such as Dubai must prepare for the future growth of urban centres. â€œPopulation growth predictions show the population of Dubai will reach over five million by 2027, which is almost a doubling in the current number of residents. Such a significant rate of population growth can lead to a variety of issues. Most notable is the construction and maintenance of infrastructure. Housing obviously has to be provided for a booming population and this can prove to be challenging particularly in already-tightly-packed cities with limited space.,â€� he said. According to the World Migration Report 2015, Dubai has the highest foreign-born population in major cities globally with 83 per cent of the emirate comprising residents from other countries. We’ve been blessed to have been kept busy by client work over the last few months which has meant we haven’t been blogging as much as we would have liked. But we’ve resolved to give some much needed TLC to azam.info going forward, so will be releasing at least one new gem each week for your delectation! Click here to subscribe for free, so you don’t miss out. Far too often we see content marketers quit at the moment of conversion, the time when a prospect turns into a customer. It appears like thatâ€™s the end of the story for most of them. The content marketing funnel doesn’t stop. As youâ€™re busy concentrating on content for the top of the sales funnel or producing ebooks and white papers for the middle-funnel, all the prospects youâ€™ve previously generated are fading into the Land of Forgotten Customers. New customers are undoubtedly important – but it’s also critical to focus on existing ones. What organizations are finding out is that viewing content as just a replacement or a campaign for other marketing focuses is the wrong strategy. When you view content as a way of feeding direct marketing operations, there’s just one attributable profit to itâ€”as a replacement for brochures, advertisements or other imaginative marketing resources. As we all know, messaging that fails to resonate with its audience can never hope to capture their attention. The truth is, content is usually more costly than all those other alternatives. It takes longer, and it’s harder, so it’s stressful – and without a strategy, you wonâ€™t get where you want to be. Businesses that are thriving have found that content marketing needs to give more than one kind of value to be deserving of the expense. It needs to present combined value over multiple areas of the organisation. Letâ€™s take a look at what this looks like through the eyes of the existing customer. Theyâ€™re part of your audience already as they’ve been through the content funnel. You hold a connection with them because theyâ€™ve bought from you, which indicates that you retain reasonable business interest to reach them. If someone already reached the bottom of your funnel, theyâ€™ll continue to be a member of your inbound traffic. Theyâ€™ve noticed your content was helpful and now that theyâ€™ve previously built a reliable relationship with you, theyâ€™re even more inclined to recommend your content to others. That’s the solution to keeping your funnel full: as existing customers recommend your content, they shift to brand advocates, the most helpful of all testimonials. If youâ€™re interested in more marketing news and guidance, be sure to check out our homepage for new articles. If you are a marketer in today’s world you need to be profoundly aware of the optimal demographics for your product or service to be successful. That insight will take your campaigns to the next level. If you don’t, you will lose out to the competition. Every age group has a set of buying habits. This information is readily available with a few searches online. It allows you to know how to propose specific offers, whether it’s a one-time promotion or a long-term subscription. But if you don’t know their age in the first place, you can’t leverage this data. Therefore you might want to tailor your social media content or your search engine advertising copy and graphics to the manner that appeals to them the most. Needless to say, providing content to retirees and semi-retirees ages 55+ is going to require a different approach than creating engaging content for millennials. For example, many retirees are faced with a surplus of free time in retirement and struggle to know what to do with it. Therefore, retirees could be a viable target for engagement as they often donâ€™t plan or adequately address their spare time in their third age. This is an example of why targeting your social media followers by age is crucial. If you want to create engaging content, you need to know who your audience is, what they value, and how your products and services can solve one of their problems. That information will affect everything from the words you use to the images in your marketing. Getting your followers to share your content can be a significant advantage. It allows you to enjoy a viral component without spending more money. When you know their ages, you can request in a way that they are most likely to hit the share button. Different generations use different language and slang. You might ask someone who is older to take action in a more formal, traditional way. On the other hand, younger people often prefer the informal approach. Most platforms today, like Facebook, Instagram and Twitter have a way to determine the age of your followers. Sometimes this is done with a central account dashboard. Other times, you need to use third-party apps. These apps have complicated algorithms that can either access the API uniquely or determine general ages by other means. Whether you use built-in data or tools or choose to purchase one, they can both be valuable. They’ll give you insights to grow your brand in the future. When it comes to the ins and outs of digital marketing it can seem overwhelming at first. But whether you are a veteran marketer or a beginner, you should focus on understanding the age categories of your target market. This will allow you to create compelling content and advertising that speaks directly to their wants and needs, increasing your conversion and profits from your endeavours! Increasing B2B sales isnâ€™t simply a matter of hanging out your shingle and hoping that more customers will come your way. Businesses who purchase from you want to believe they have the right vendor at the right time for the right price. Because there are more people involved and there are higher price points, we know from experience at Azam Marketing it can often take months to close a business-to-business sale. As a business who markets to other businesses how can you tilt the playing field and make sure that when the customer is ready to buy, your company is the one that comes to mind? Feedback, whether received through surveys, in-person interactions, or email, is vital for both technical improvements to your site and funnels and your customer-facing work. Because in-depth and useful feedback from clients is hard to come by, itâ€™s important that you take steps to automate the process and encourage your clients to provide you with more. Talk with your clients. Find out what they liked and what they didnâ€™t like. Talk about the number of steps that they took to get to the sale and the process that they went through. Ask them what about your company caught their attention and what they didn’t like. Your customers’ needs are constantly evolving. By listening to what they are saying and keeping your â€˜finger on the pulseâ€™ you can stay ahead of the competition, making more sales for your company. There are compelling reasons to have video on your site, but the biggest reason is that itâ€™s one of the most effective means of selling your companyâ€™s product. Customers and clients engage with video, often watching and engaging with the shorter ones for the entirety of the clip. Here are some noteworthy statistics about video marketing. Depending on your products, your videos can have many purposes. How-to videos explaining a single part of your product. Explainer videos that outline what your company does and how it does it. Funny videos designed to get others to think about your product. Video testimonials from your clients to persuade others. Upselling and cross-selling have increased sales of B2B and B2C companies for ages. Upselling simply offers a higher version of the product itself. Cross-selling offers related products to your clients. Amazon has this tactic down cold. For instance, If you place an order for a laptop, you will inevitably be asked whether you want to upgrade the memory card or get a better one. It is the logical thing to do and, shown to millions of people every day, boosts Amazon‘s sales and revenues. The intent behind this is showing the customers that he could get a better product by spending a little extra. The McDonaldâ€™s sales force are also pros at this tactic. Cross-selling offers your client something different but related to the first product. For instance, youâ€™ll most likely be asked the famous question, “would you like fries with that?” or the less leading, “will that complete your order?” with every order. This gives McDonaldâ€™s customers to look at the menu for another few moments, pondering their next mouthwatering treat. Cross-selling and upselling tactics can be applied to nearly any business who wants to improve its bottom line and increase B2B sales. By offering multiple versions of the same service or related services, you can create a selling juggernaut with your already â€˜warmâ€™ clients. The top 5 B2B content marketing tactics: Social Media Content (92%); eNewletters (83%); Articles on your Web Site (81%); Blogs (80%); In-Person Events (77%). The event you hold doesnâ€™t have to be something very formal. You can set up something on Meetup for your contacts and clients to attend. By offering them something different to get them in the door, you are getting your brand to stand out and lining up potential customers. Whether your business constantly generates data and whether you have hired a marketing agency like yours truly or you are the one doing the advertising, leveraging that data into the creation of case studies – and perhaps white papers – is often beneficial for your business. Case studies generates fuel for the fire to get more clients interested in your product or service because itâ€™s measurable proof of what your company does. 73% of buyers used case studies in B2B purchasing decisions (2016 DemandGen Report). Fortunately, developing a case study mostly involves the collation of materials rather than the creation of new materials. Look at your customer successes. Are there ways that you can parlay that into viable case studies? These 5 marketing tactics to increase B2B sales are by no means the only way to capture the attention from customers and earn higher revenues from them. Each tactic has its pros and cons, but all of them give you the opportunity to increase your bottom line. What steps can you begin to implement today to increase your companyâ€™s revenues? A slightly different version of this article is originally posted at Tenfold. Your favourite digital bods are thrilled to be entering the video age with a series of exciting new videos. The first releases have been created for the tens of thousands of loyal followers of our social media channels and their aim is to infuse folk with hefty dollops of inspiration sprinkled with pearls of wisdom from some of the greatest minds in history combined with what we have learned while running Azam Marketing. We have created bespoke videos for each of our several different Facebook and Twitter accounts. The videos are similar, so we’ll showcase just a couple of them below for your delectation. Twitter only allows videos to be up to 2 minutes 20 seconds in length and so we created the above to be just one second shorter than that limit. Facebook’s maximum time length is a lot longer (at 45 minutes), so we were able to shoot slightly longer videos for that channel and include another quotation from the “Wizard of Menlo Park”. We’ve uploaded a few other videos to our YouTube channel in the last couple of weeks, including two indepth tutorials that are over forty minutes long each and pure gold dust, so make sure you check it out and subscribe here! 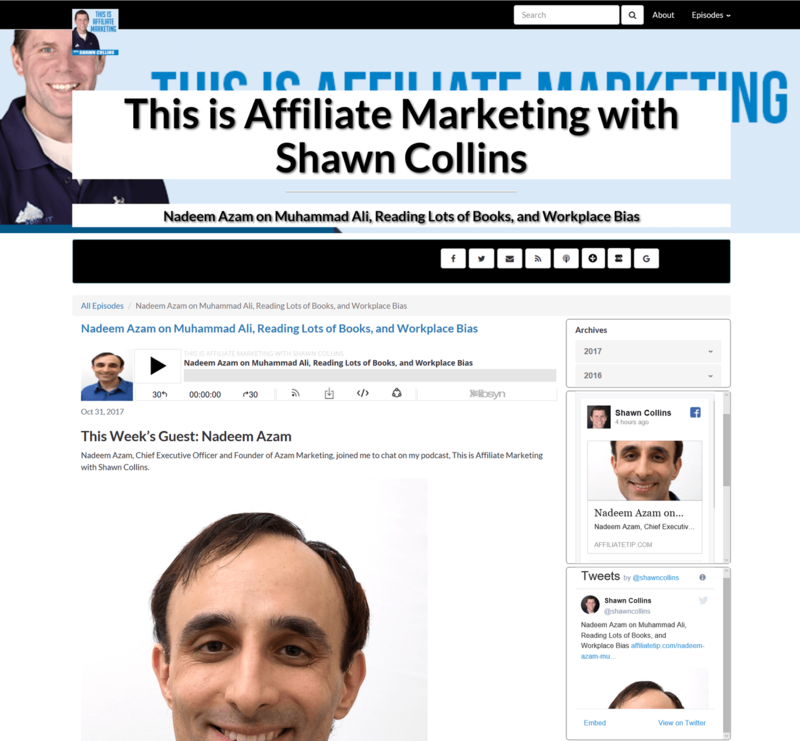 I’ve been interviewed several times by radio and television stations this year, but the interview I’ve enjoyed the most is with Shawn Collins as part of his renowned ‘This is Affiliate Marketing’ podcast series. For those people who don’t know him (have you been living under a stone??!! ), Shawn is a legend in the affiliate marketing industry, having been a key figure in its development since he started out in 1997. Shawn is Co-CEO of the Affiliate Summit, an industry conference for affiliate marketing, which regularly sells out and features the biggest names in performance marketing. He is also the Co-Editor-in-Chief of FeedFront Magazine. His book, Successful Affiliate Marketing for Merchants is the best selling book in the space, and it is considered to be required reading by affiliate managers. He also wrote the Amazon bestselling book, Extra Money Answer, as well as Affiliate Manager Boot Camp: Recruiting, Educating, and Retaining Affiliates. Shawn makes a point of not “talking shop” in his podcasts and there is no business talk; instead he tries to get to know what makes the personalities in the industry tick. As Shawn states, “affiliate marketing is about the people, not the companies”. My team and I at Azam Marketing have lots of exciting things we will be announcing over the next few months so subscribe to this blog to remain updated for free.